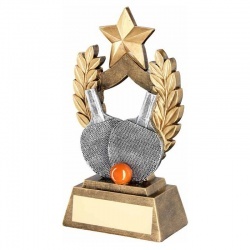 A selection of table tennis trophies and awards, including glass plaques, suitable to be engraved as table tennis prizes and offered with text and logo engraving options. 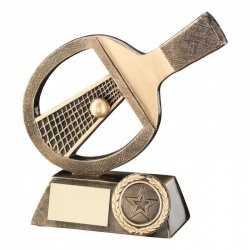 Table tennis bat trophy in bronze & gold colour finish, with base plaque. Detailed resin table tennis scene in bronze & gold, with 1in centre and base plaque. 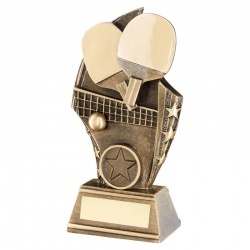 Detailed resin table tennis theme trophy in silver, bronze & gold colour finish. 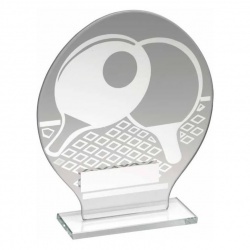 Circular jade glass plaque in silver finish with table tennis motif. 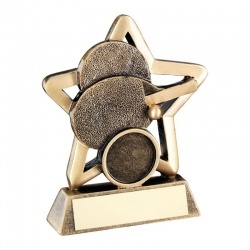 Detailed resin table tennis award in bronze and gold colour, with base plaque. Detailed table tennis scene with in bronze and gold with 1in centre & base plaque. 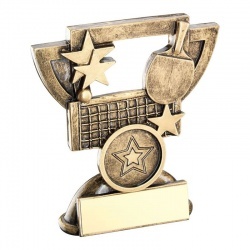 This collection of table tennis trophy awards also includes a men's table tennis award and a versatile star arch award that is suitable for both men's and women's table tennis awards as well as both individual player and team competition prizes. Click any product image or title to view full details and buy online.